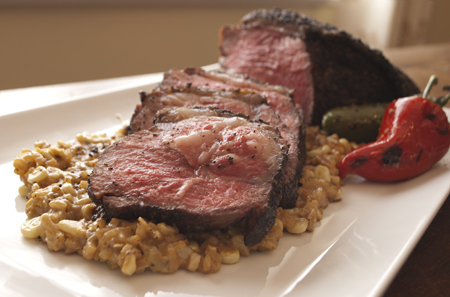 This recipe for Coffee Rubbed Steak with Creamed Corn & Tomatillo Risotto is hearty and rich with loads of complex flavors. The subtle layers of coffee, smoke and savory seasonings infuse the marbling with more distinction that begs for a wine pairing. The risotto also plays well with Sauvignon Blanc's roundness and minerality, as well as a good Pinot Noir. Toast the cloves, peppercorns and coriander in a dry skillet till fragrant. Once toasted, remove from heat and let cool in a bowl. Using a coffee grinder or other grinding device, grind all toasted seeds to a powder consistency. Mix the salt and coffee evenly into the toasted spices. Prepare your coals or heat your grill. Generously rub the seasoning mix into the meat, massaging it well. When the grill is ready, sear the meat over the hottest part of the grill for 23 minutes on each side to seal in the juices. Once the outside has been caramelized, move the meat away from the heat to cook it indirectly with the lid down. Cook time varies based on the cut and thickness of the steak. Use a meat thermometer to determine if it is ready. The target temperature is 135137°F. Remove from heat and let rest for ten minutes before carving. Prep your ingredients by mincing the garlic cloves, chopping the onions and thoroughly cleaning the tomatillos. Once clean, cut them into quarters. In a large pot, add the olive oil and sautée the onions with the cumin till they become slightly translucent. Next, add the minced garlic to the pot and brown. Then, add the tomatillo quarters to the pot, stirring and cooking till they become somewhat soft. Add the dry rice to the pot and toast for a couple minutes. Once toasty, add the wine to the pot stirring continuously over medium heat. As the wine begins to absorb, add one cup of broth. The broth will begin to absorb after a few minutes add another cup and stir. Taste for doneness after 15minutes. Repeat this process till the rice is al dente. Once the rice is nearly to your desired doneness, stir in cream, salt and pepper to taste. Remove the risotto from the heat when the desired bite has been reached. Serve as a creamy bed for the steak or on the side. Garnish with fresh Italian parsley if desired. This post has been contributed by Leo Coulourides, our Culinary Specialist.